Rescuers in China say they now believe that an estimated 57 coalminers are trapped underground in a flooded mine in the northern province of Shanxi. Chinese news agencies said on Sunday that 44 people were trapped, but they have now increased this figure. 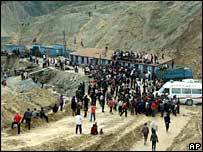 The accident happened on Thursday, when the mine was hit by a sudden surge of floodwater. Many of the miners managed to scramble clear, but others were cut off by the rising water level. Rescuers have rushed pumping equipment to the scene in an effort to save the trapped miners. Li Yizhong, director of the State Administration of Work Safety, told Xinhua news agency that the miners were working in an area beyond the approved limits when the accident happened. The managers of the mine have also been accused of failing to report the true size of the disaster. To keep the extent of the accident hidden, relatives of missing miners were driven by taxi out of Shanxi, "to prevent them from rioting and speaking to the press", Xinhua said. Nine managers have so far been detained, according to Xinhua. Police are reportedly still hunting for the owner of the mine. China's mines are among the most dangerous in the world - more than 5,000 deaths are reported every year in fires, floods and explosions. The government announced earlier this year it would shut down all small coal mines by 2007, in an attempt to improve the industry's safety record. Coal generates more than two-thirds of China's electricity, and production has been stepped up to meet demand.